Bring your gouges, scrapers, scribes, and chisels! Printmaking tools are often very similar to those used in woodworking, but there are a few unique variations such as three-sided scrapers and burins. Learn the principles of sharpening and which regimen will suit your practice from one of our favorite artists, Carol Russell. Renowned for her fine woodworking and engaging workshop instruction, we’re thrilled to kick off this regular session addressing a critical but rarely discussed aspect of studio life. We will cover when to sharpen, when to hone, and how to protect your investment in fine tools. Feel free to bring a selection of your own tools for one-on-one advice. There will be time to sharpen at least one or two on the day depending on the number of participants and flow of the session. Carol will provide sharpening stones and materials for use in the workshop, and a take-home kit of your own strop, honing compound, tool oil dabber, and other basics. GHP will provide refreshments; please contact us if you have any specific dietary requirements! 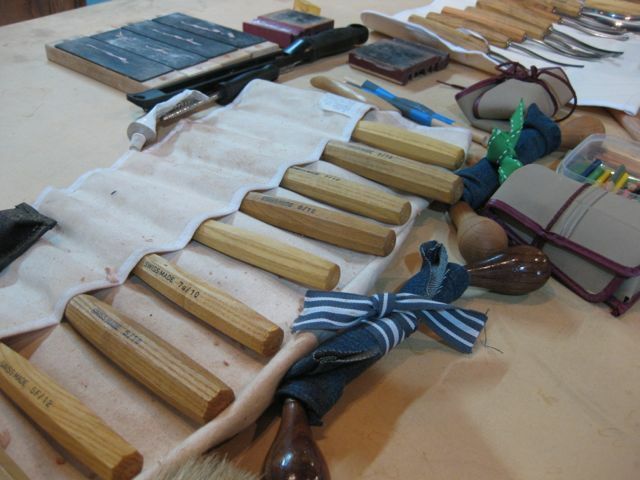 Please note that while this workshop is primarily arranged for printmaking tools, that doesn't mean we'll turn away other woodworking tools and knives in general! Open to anyone, not exclusive to printers. Cost: $105, Book tickets here! We require a minimum of four participants in order for most of our workshops to run. Unfortunately, there are times where we do not reach the minimum participation and classes need to be cancelled. In the instance that a class is cancelled by Grey Hand Press due to low numbers, we will provide all participants with notice at least 4 days prior to the first day of class, and fees will be refunded to the participants in full. If a workshop is cancelled due to uncontrollable circumstances such as illness or force majeure, participants will be notified and provided with a full refund, as well as a discount to use on another class with GHP. If a participant needs to cancel their workshop booking, they can do so by contacting Grey Hand Press to request cancellation within seven days of the workshop date. If a cancellation request is received within this time, a full refund will be provided. As we prepare materials based on the number of attendants, if a cancellation request is received less than 5 days prior to the start of the workshop, Grey Hand Press will retain 50% of the booking amount in order to cover the preparations that have already been made for the student’s place in the workshop. If a cancellation is made within 24 hours of the workshop date, unfortunately we cannot provde any refund. We understand that life happens and cancellations may need to take place, however, as a small business we also need to cover our costs. Alternatively, prospective students are welcome to pass on their place in the workshop to another person. Just get in touch to let us know! There are a couple of parking spaces out the front of the studio, however, there is plenty of free on-street parking on Crockford Street as well. The studio is located within the Northgate Workstores precinct on the corner of Crockford St and Earnshaw Rd. Access to the GHP studio is from the Crockford Street entrance. We are a short walk from Bindha train station (Shorncliffe line), and both Northgate and Banyo train stations are located approximately 15 mins walking distance from the studio. Yes! If you cannot attend, you are welcome to give your ticket to someone else. Just let us know prior to the event! Any additional fees on my ticket? Ticket price already covers the Eventbrite fee and GST — no additional charges! You will receive a tax invoice as part of your booking confirmation. Practicing artists can of course claim workshop fees as business expenses!